Chiropractic adjustments have been shown to be a safe and effective alternative treatment for pain and injury. Chiropractors perform 95% of all adjustments in the world to correct misalignments of the vertebrae in the spine and bones in the extremities. Chiropractic adjustments are performed by applying gentle, yet firm pressure to a bone or tissue with an added quick thrust. The goal of any adjustment is to restore the bone to its natural, or original, position and increase certain restricted motions of the bone. The important thing to remember is that the act of the adjustment frees—not forces—a vertebra to allow it to restore its proper position and mobility. By restoring a bone to its normal position it provides positive neurologic feedback to the brain, and allows for proper motion to occur at the joint thereby inhibiting, or preventing, pain signals from being sent to the brain from the affected area. Not only does the actual joint that was manipulated change, but it can also effect surrounding joints as well in a positive way. An adjustment will also cause the muscles surrounding the joint and possibly the muscles innervated by nerves at that level of the spine or area of the body to reset and restore proper balance. Chiropractors take many factors—including size, weight, and muscle structure—into consideration when deciding on which adjustment technique to use. Sometimes manual therapy or muscular massage are used prior to a spinal manipulation in order to relax the muscles in the affected area. Chiropractic adjustments are performed to help treat a wide variety of conditions. For more information about what types of conditions research studies are showing to benefit from chiropractic care please see our patient education page Benefits of Chiropractic Care. Adjustments can be performed while sitting, standing, or lying down. Some adjustments involve special instruments or tables. At Synergy Chiropractic, we occasionally use a "drop piece" where the table shifts slightly assisting the doctors manipulation force. We also use a manual adjusting tool commonly referred to as an Activator. It is a spring loaded handheld tool that delivers a small but quick thrust at a variable force. These tools are used only when the situation or patient warrants this type of treatment, but it is not used on every patient at every visit necessarily. Motion Palpation/Diversified: a manual technique the chiropractor uses to determine if your vertebrae are properly aligned by applying pressure in various directions through a joint, after which they will correct the misalignment via the proper direction of thrust. Maignes Technique: a manual technique in which the patient lies face up on the table and the chiropractor gently rolls them over a hand contact underneath their back. Lumbar Roll: a manual technique in which the chiropractor applies a firm, yet quick thrust with a pulling vector to a misaligned vertebra while the patient lies on his or her side. Extremity Adjustments: a manual or instrument-assisted technique in which the doctor performs small thrusts on the bones of your feet, ankles, knees, hands, elbows, or shoulders. Mobilization: a manual technique in which the chiropractor applies gentle pressure with the hands to separate or approximate the vertebrae or other bones. Respiratory Adjustments: a gentle, manual technique in which the chiropractor applies pressure to a bone in a certain direction while the patient is either inhaling or exhaling. Pelvic Blocking: a technique in which the chiropractor places soft blocks under the pelvis in certain ways to realign the hips. This technique is very gentle and there is often a light pumping thrust on a specific contact on the hip that assists the pelvic realignment. Instrument Adjustments: the use of a spring-loaded device as an adjusting tool to correct a subluxation. This type of adjustment is used more with elderly or younger patients, or any patient needing less motion induced into their joint than is typically applied by hand. It is also a large part of the Total Body Modification technique. A very common concern of new patients is the question of whether or not adjustments will cause pain or discomfort. The wide majority of adjustments administered do not involve any pain or discomfort. On the contrary most patients feel relief and find it to be a pleasurable experience. 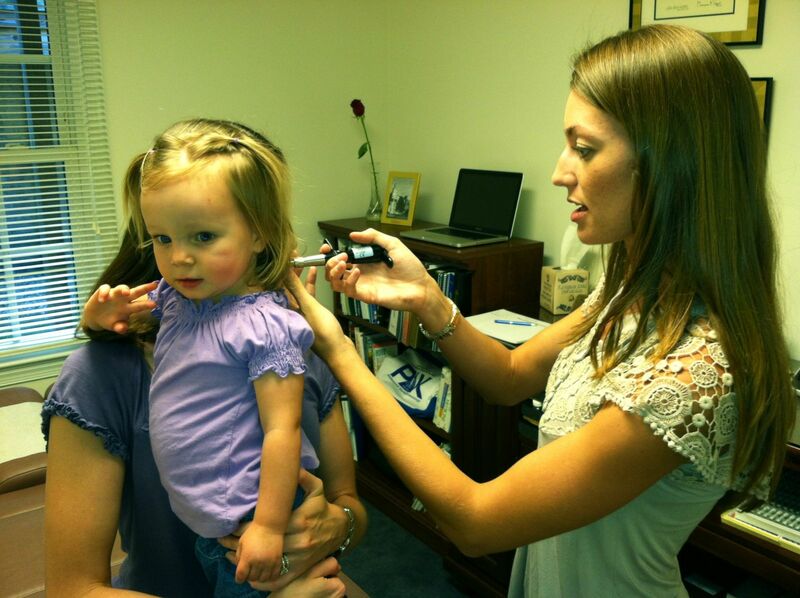 As can be observed in the picture above, even our youngest patients aren't concerned with getting adjusted. There are some patients that experience mild aching or soreness in their spinal joints or muscles post-adjustment, but it is not common. Also, if such discomfort does occur, it typically will only last for a short period of time. The cause of such discomfort is due to the breaking of fibrous adhesions surrounding the joint that was being manipulated, which formed due to its lack of normal motion. The adjustment frees the joint of these adhesions and restores proper motion and function to the area, but in the process there can be a mild inflammatory healing reaction to break down and remove the adhesion debri. Chiropractic adjustments can leave you with a greater sense of well-being, a calming sensation, and most importantly put you on the road to a life without pain.The important thing for a patient to keep in mind is to try to remain relaxed, as stiffening up may impede the adjustment process. "Popping" sounds are sometimes heard during adjustments; these are usually pockets of gas being released from the joint fluid and are completely normal. The sound can also come from the freeing of restrictions/adhesions surrounding a joint that form when there is a lack of normal joint motion. If you have any concerns or questions about the type of work we do or type of adjustments that may be indicated for your certain condition please feel free to Contact Us.